had to give your pet to a shelter! Hello, and welcome to the New Jersey AniMeals website. In honor of our 10th Anniversary in 2017, we have two exciting events in September, and we hope you will join us. Thank you for visiting, and please check us out on Facebook too! New Jersey AniMeals focuses on pet retention – keeping cats and dogs at home with their people-in-need. We help them stay together, so pet owners-in-need can continue to enjoy the profound mental, physical, social, and emotional benefits of loving and being loved by their animals, and… fewer pets are surrendered to shelters! 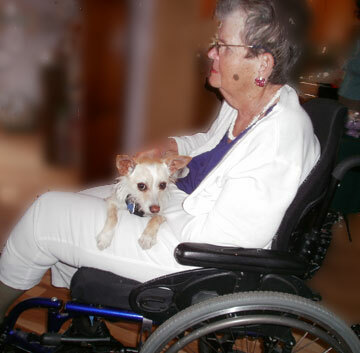 Every month our volunteers deliver free dog and cat food and litter to disabled, shut-in, and low-income pet owners – many of them senior citizens -- who cannot afford to feed their animals and are at risk of losing their cherished pets to shelters. Since 2007, we have delivered many thousands of pounds of dog and cat food and litter to pet owners in Hunterdon and Warren counties. Our program continues to grow, and our goal is to expand until there are no more cats and dogs facing hunger at home and the awful possibility of being separated from the people they love. NJ AniMeals is an all-volunteer organization supported entirely by donations and grants. We depend upon and appreciate your support. NJ AniMeals is a 501(c)(3) nonprofit under the Coalition for Animals. An easy and convenient way to donate, Amazon Wishlist can ship much-needed product donations directly to us!